This semester, Duke opened a new flexible teaching and learning space in Perkins Library, called the Link. The Link supports student and faculty learning, teaching, and collaboration by offering several flexible, multimedia capable classrooms in addition to many informal meeting rooms and break-out spaces that encourage group and student engagement. As part of what will hopefully become a continuing trend, CIT will begin posting faculty-written reflections of their experiences teaching in the Link. 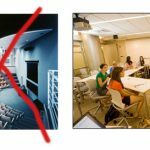 Following, is the third and final post in a series from Caroline Bruzelius, Anne M. Cogan Professor of Art and Art History. Read the first post by clicking here or the second by clicking here. During the week of December 1, the students had ten minutes to present their projects. They were free to do this in any way they liked: as a “performance” or a straightforward presentation. In evaluating each presentation, we consider the quality of the overall conception, the coherence of the three parts (fictional history, architecture and decorative program), and certain ineffable qualities in the project: brilliance of concept, and inventiveness, as well as charm and humor. At the end of the semester, each time I teach this course, I am amazed that students who have had no previous background in the Middle Ages or in Art History are able to come up with compelling historical narratives, wonderful decorative programs, and terrific architectural designs. This year was particularly striking in its wide-ranging and inventive approaches, because there were projects set all over Europe and the Near East: Turkey, Cyprus, Northern Germany, and Spain, as well as England, Italy, and France. Although the Gothic style was born in France, the students took it “on the road” in their projects and designed it in relation to local conditions, such as the need for earthquake-proof design (Turkey), the use of locally-available materials ( brick, instead of stone in N. Germany), or the insertion of the cathedral into a former mosque (Spain). 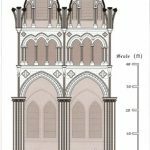 (Note: This is a slideshow of images of the completed cathedral designs. It will cycle through images automatically, or you can click on an image to see the next image). So now – out of a class of majors in topics such as Chemistry, Political Science, History, Engineering, etc. – we have crafted a group of wonderfully resourceful and inventive medieval architects, iconographers, and historians. In the fictional narratives, the “rediscoveries” of long-lost local saints, the recreation of ancient trade routes bringing income and ideas, the writing of “budgets” that would define income as well as the expenses of materials and labor, are stimulating exercises that on some level recreate the experience of building a major architectural project in a distant historical period. I am so very proud of my students, and love what they do. (Note: This is a slideshow of images of the class. It will cycle through images automatically, or you can click on an image to see the next image).